Well, we certainly wouldn’t want any sort of dispassionate, rational discussion on the subject. It might not come out they way the EUlite want! A survey conducted on behalf of SPIEGEL found a dramatic shift in public opinion — Germans are losing their fear of climate change. While in 2006 a sizeable majority of 62 percent expressed a fear of global warning, that number has now become a minority of just 39 percent. Is that what Ott considers to be the “effectiveness of climate change warnings”? I’m all for that kind of “effectiveness”. P.S. Isn’t it amazing how people can see this, yet think “that couldn’t happen with other government regulatory policies I support”? Regard warming, I’ve always considered it a religion. Fear of Gaia in this case instead of fear of god. There’s been a whole lot of progress on climate change on the science side recently, and none of it supports the concept of catastrophic climate change due to man. It’s in my “to post about” list, but, as usual, you beat me to the punch. Regard your P.S., I can’t remember the guy’s name, but there’s some effect named after him. He was a famous scientist and every time there was an article about his work, he noted that they got it totally wrong. Yet, he was absolutely certain that everything other article printed in the paper was flawless or nearly so. Just a good example of the appeal of authority. You’ve beaten me so many times on the “I need to write about that” front that I feel no guilt whatsoever. Nyah nyah! Why yes, it is amazing! Why the resolution of your graph suddenly gets so diminished after 2000? Continuous line of data up to 2000, then only one point? And superposed to a suggestive non verifiable curve of descent? Thanks God you are a programmer. BTW, you can see real graphs here. You can see the graph is marked “Observational Data” for the detailed region. The curve of descent is more verifiable than the IPCC curve, in that it’s closer to the actual data. Do you consider the warmenist argument validated unless specifically disproven? Is there any actual burden of proof, especially scientific proof (such as accurate predictions)? I looked at the “real” graphs, and they look about the same to me. Even the IPCC admits that. My point is that neither curve can ever be “more verifiable” with only one point. Yes, I think both are very speculative. But only one is being used to justify a global re-structuring of our economy, and as long as that is being done, I will oppose basing it one point to determine a curve. “Recovery from Little Ice age” and “multi-decadal oscillation”? Oh, how come no one ever thought of this? Plenty of people have thought of it - netsearch those terms. I’ve been reading about them for years and I’m not even in the field. Arguments about the Little Ice Age and recovery from that have been brought up since the very early days of global warmening. That the warmenists ignored it even after it was pointed out again and again is a big reason I consider them to be not doing science. —- I will oppose basing it one point to determine a curve. —- But only you are basing the whole thing in a point, which was my initial comment. Take a look on all the other pieces of evidence - for example, the other graphs at tha website I linked above. My comment on the little ice age were sarcastic - the topic is part of every book and essay about global warming and it was not ignored by anyone, as far as I know. Did you miss the Michael Mann & Hockey Stick controversy? He and his ilk certainly ignored the MWP & LIA. Flattened them right out of the data. So no, certainly not “every” book and essay. The point is simply where we are now. It’s a “you are here” marker. It’s not the entire basis for the graph, which contains a lot of other data. I’m also not trying to convince anyone of anything with it — as I wrote, it’s a graph I wanted to keep track of because it would be useful in constructing an actual argument, not that it is one by itself. I would also note that science consists essentially of trying to falsify theories, and sometimes one data point is all you need to do that. However, it’s not me who says “the science is settled”, it’s not me who calls anyone dissenting from the warmenist theory “a denier”, it’s not me who says “there is no debate”, it’s not me who says we have to have fear to force policy changes. If the result of someone looking at the graph was to think “interesting, there are competing valid theories about climate change”, I would consider that a complete success. And whatever you do, do not listen to those nut case anti-science people at MIT. As Instapundit frequently writes, I’ll take the warmensists seriously when they act like it’s serious. Bret: You are talking about the Gell-Mann Amnesia Effect. You also said Did you miss the Michael Mann & Hockey Stick controversy? He and his ilk certainly ignored the MWP & LIA. Flattened them right out of the data. Gibbon wrote Decline and Fall of the Roman Empire in the late 1700s. About halfway through the first volume, he spends a couple pages talking about, of all things, climate change. Using primary references, he demonstrated that the European climate had undergone several changes from cold to warm and back over the preceding 1500 or so years. How Mann et al got away with eliminating first hand experience in favor of some tree rings remains a real mystery. Whenever I hear or read this, I am completely baffled. Catastrophic Anthropogenic Global Warming (CAGW), or whatever it is called now, is alleged to be a scientific theory, which has become sufficiently determined to be considered settled. I’m calling shenanigans. Veering into the philosophical for a moment, all scientific theories are hypothetico-deductive constructs. That is, in order for some set of statements that constitute a hypothesis to be considered within the realm of rational inquiry (aka “science”), that set of statements must include deductive consequences. For example, evolution is a scientific theory because it includes many deductive consequences (earth must be very old, inheritance must be particular, etc). If even one of those consequences is violated, then the theory is either false, or at least incomplete. For another example, according to Newtonian mechanics, we should not be able to distinguish both stars in a binary star system. But we can, and when telescopes of sufficient acuity were invented that could detect those systems, the very first cat was out of the bag that Newtonian mechanics were wrong. Contrast with CAGW. Has anyone ever heard of one deductive consequence of CAGW? In other words, if the CAGW hypothesis can be considered a valid scientific theory, what deductive consequences must follow? Actually, no, I do not know what this Mann & Stick controversy is about, I’ll look for it. What I can tell you, though, is that most sources of global warming discussion I’ve read covers those subjects. No one is hiding things as if there was a great conspiration to manipulate facts. I do not consider anything at all related to climate science as fundamentally “settled”. We barely can foresee the weather in a few weeks because of the chaos present in the most simple system of differential equations that deal with it, what to say of the temperature of the earth in a few decades. The computational models for that were, are and will remain being the weakest point of this science. Still, there are plenty of data pointing to overall warming - well, look to your own graph! - and its consequences. It is a completely valid scientific pursuit to understand the why’s and how’s of that. Sorry, but unless you intended to mean something else, I can assure you this is completely false. We do differentiate stars in binary systems every day, using nothing more than Newtonian mechanics. Thanks. It was driving me nuts that I couldn’t remember Gell-Mann’s name. Catastrophic global warming. 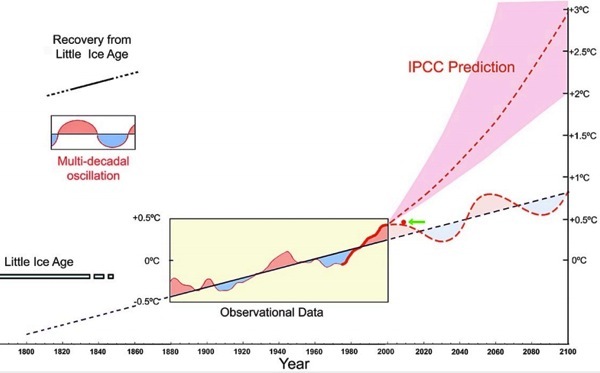 The trend line in the observed data of the graph has none of that, only the IPCC projections do. What are the consequences? Please detail some of them for me and we’ll see how “scientific” they are. Policy response, which seems to be (for every and all crises) a massive expansion in taxing and regulation. One begins to suspect that it’s the response, and not the crisis, which is the point. 1) I agree there are a lot of people out there who picked up global warming (and other ecologic topics) as their new religion. I am not one of them, so we can get over this point. Furthermore, it is still too early to decide if any “catastrophic” warming is definitely discarded. The computer models being wrong do not imply the contrary of their previsions must follow. Nature usually don’t care much for our models. Please, notice my emphasis in “possible”. Global warming, contrary to Newton mechanics as compared by H. Skipper above, is not a theory on itself. It is a conglomerate of interdisciplinary sciences, with a strong statistical nature that, by itself, condems it to not be always rock solid on its predictions. 3) What policy response? I did not see many up to now, did you? [Clovis:] Sorry, but unless you intended to mean something else, I can assure you this is completely false. We do differentiate stars in binary systems every day, using nothing more than Newtonian mechanics. The fact that you can see a smaller star orbiting a larger one means that Newtonian mechanics is wrong. Or, to put it in another way, Newtonian mechanics works just fine, so long as gravity and velocities are non-relativistic. So you can calculate orbital periods, the center of the system, etc with NM. But assume a binary star system whose plane is not perpendicular to the line of sight from Earth. At every point in the orbit of the smaller star around the larger (except at the two points where velocity is perpendicular to the LOS from Earth), the vector will be pointing away, or towards, earth. So, if NM was true and complete, the light from the orbiting star as it is receding from earth would arrive after the light from the same star as its vector is pointing towards earth. Since the normalized vector swings through 360º as the smaller star orbits the larger, the transit time for a given photon would vary because it is summed with the orbiting star’s instantaneous vector. Unless, of course, the speed of light is absolute, which NM doesn’t allow for. This post was about warmenists, and those (like me) who mock, that is those who worship Gaia as their religion. If you’re not one of those two categories, this post mostly didn’t apply to you. NASA has covered itself in shame on this issue, particularly Hansen, so I mostly disregard anything from there except hard data. Your cite is basically a rehash of the IPCC, which is a political document created by a political committee subject to political review and the very subject of the original post. You now expect me to take the precise document I wrote this post to mock as strong evidence? The IPCC reports have been rife with bad science, bad data, and bogus assertions. Note that it is precisely that report the graph discredits. To pick a couple that struck me, there was reduced snow cover (aka “no more snow in the UK”, massively wrong) and the increased cyclone activity (not so, says the US National Hurricane Center). So I have seen many of them. I can’t tell if you’re being sarcastic or not about not seeing these things. It is difficult to think of an issue for which there has been more policy response around the globe, both proposed and implemented. Now, why don’t you explain to me why I shouldn’t mock people against “climate change” (their phrase) as much as I would mock people against continental drift? Ok, now I see what maybe was H. Skipper’s point. It is still mostly improbable that you would not be able to differentiate between both stars in NM, for the above effect - assuming the velocity of light had a Galilean behavior - would still make the differentiation difficult only in exceptional situations. Even when the velocities of the stars were comparable to the velocity of light, and their orbit plane too close from our line of sight, differences between the stars emission lines (e.g. their composition and surface temperature) would allow for differentiation, for example. By all means, feel free to mock anyone you want in your own blog.